Photonic sensor; skin-attachable loudspeaker, microphone; stabilizing sodium-ion batteries. Researchers at Washington University in St. Louis devised a way to record environmental data using a wireless photonic sensor resonator with a whispering-gallery-mode (WGM) architecture capable of resonating at light frequencies and also at vibrational or mechanical frequencies. The photonic sensors recorded data during the spring of 2017 under two scenarios: one was a real-time measurement of air temperature over 12 hours, and the other was an aerial mapping of temperature distribution with a sensor mounted on a drone in a St. Louis city park. Both measurements were accompanied by a commercial thermometer with a Bluetooth connection for comparison purposes. In the sensor, light propagates along the circular rim of a structure by constant internal reflection. Inside the circular rim, light rotates 1 million times. Over that space, light waves detect environmental changes, such as temperature and humidity. The sensor node is monitored by a customized operating systems app that controls the remote system and collects and analyzes sensing signals. 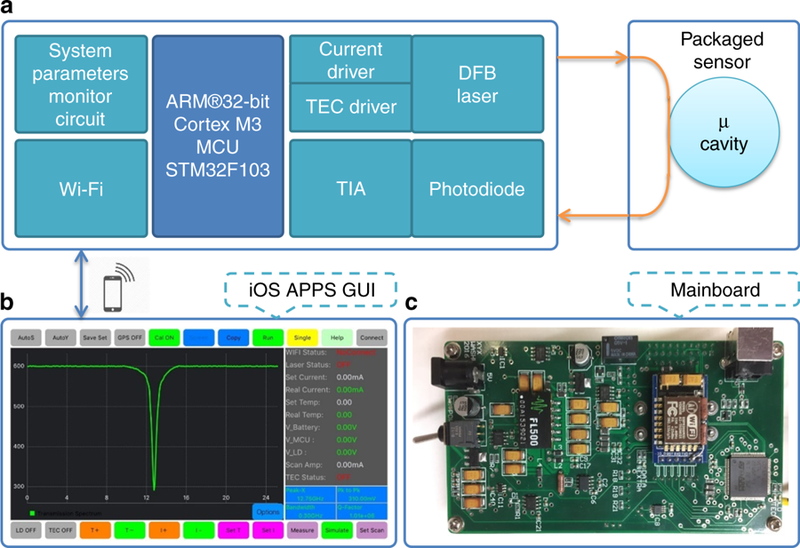 A smartphone app allows for control of the sensing system over Wi-Fi. 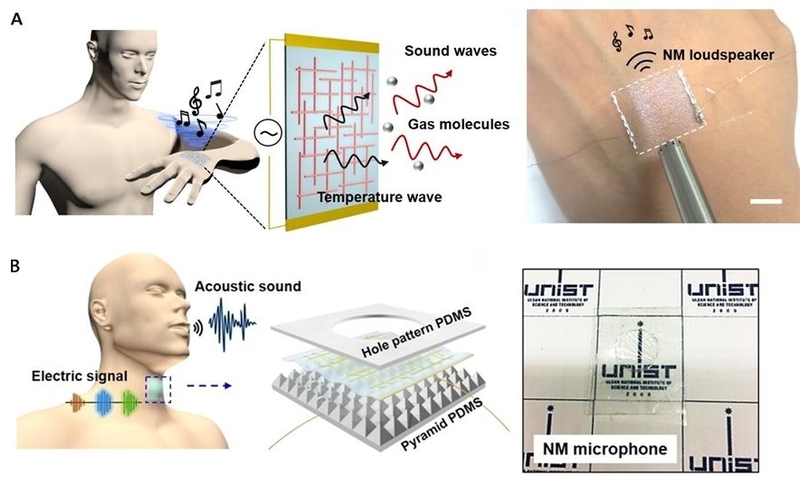 Researchers from the Ulsan National Institute of Science and Technology (UNIST) developed skin-attachable nanomembranes capable of acting as either loudspeakers or microphones. The hybrid nanomembranes are ultrathin, transparent, and conductive, made of an orthogonal silver nanowire array embedded in a polymer matrix. The membrane is less than 100 nanometers thick, and can conform to a wide range of objects, including human skin. “These layers are capable of detecting sounds and vocal vibrations produced by the triboelectric voltage signals corresponding to sounds, which could be further explored for various potential applications, such as sound input/output devices,” said Saewon Kang, who is in the doctoral program of Energy and Chemical Engineering at UNIST. The skin-attachable nanomembrane loudspeakers work by emitting thermoacoustic sound by the temperature-induced oscillation of the surrounding air. The periodic Joule heating that occurs when an electric current passes through a conductor and produces heat leads to these temperature oscillations. The wearable microphones are sensors attached to a speaker’s neck to sense the vibration of the vocal folds. This sensor operates by converting the frictional force generated by the oscillation of the transparent conductive nanofiber into electric energy. For the operation of the microphone, the hybrid nanomembrane is inserted between elastic films with tiny patterns to precisely detect the sound and the vibration of the vocal cords based on a triboelectric voltage that results from the contact with the elastic films. While designed in part to help the hearing and speech impaired, the team says the new technology can be further explored for various applications such as wearable IoT sensors, voice-based authentication, and conformal health care devices. However, for commercial applications, the mechanical durability and performance of the loudspeaker and microphone will need improvement. Researchers at Purdue University developed a method to improve the stability of sodium-ion batteries by adding a sodium powder during production. While sodium is cheap and abundant, sodium-ion batteries would be physically heavier than lithium-ion batteries, this is not necessarily a disadvantage for static installations such as solar and wind power facilities. The researchers proposed using sodium as a powder, which provides the required amount of sodium for the solid electrolyte interface to protect carbon, but doesn’t build up in a way that it consumes sodium ions. They minimized sodium’s exposure to moisture, which would make it combust, by making the sodium powder in a glovebox filled with the gas argon. To make the powder, they used an ultrasound to melt sodium chunks into a milky purple liquid. The liquid then cooled into a powder, and was suspended in a hexane solution to evenly disperse the powder particles. A few drops of the sodium suspension onto the anode or cathode electrodes during their fabrication allowed a sodium-ion battery cell to charge and discharge with more stability and at higher capacity – the minimum requirements for a functional battery. “Adding fabricated sodium powder during electrode processing requires only slight modifications to the battery production process,” said Pol. “This is one potential way to progress sodium-ion battery technology to the industry.” The team has filed a provisional patent for the technology.